Morrissey's return to the stage will have to wait one more day: the singer has canceled his appearance tonight on Jimmy Kimmel Live, but this time he's citing moral reasons instead of health concerns. The outspoken vegan and PETA advocate said in a statement that he objects to another of Kimmel's scheduled guests, stars of the A&E reality series Duck Dynasty, who make products for duck hunting. The statement, posted yesterday on the fan site True to You, said that while the singer is "thankful" to have been invited to perform on Kimmel, "he cannot morally be on a television program where the cast members of Duck Dynasty will also be guests. 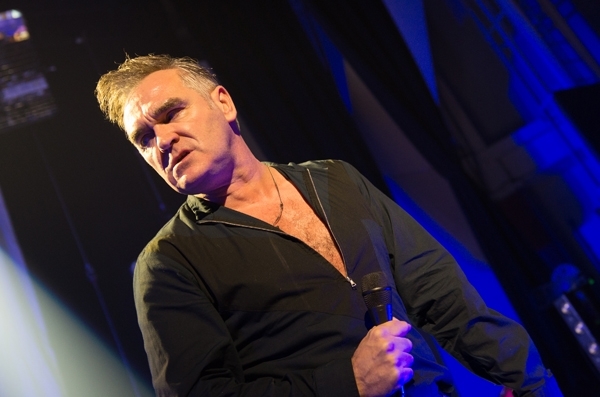 Morrissey would be honored to play the show, if Duck Dynasty were removed." The singer is quoted as saying, "As far as my reputation is concerned, I can't take the risk of being on a show alongside people who, in effect, amount to animal serial killers. If Jimmy cannot dump Duck Dynasty then we must step away." According to Billboard, Kimmel sought a compromise with the singer, which could have included taping his performance earlier. Instead, the show has replaced Morrissey with Denver band Churchill. The performance was to have been Morrissey's first since last month, when he canceled a string of dates after he was admitted to the hospital and diagnosed with a bleeding ulcer. The former Smiths leader is now scheduled to resume his tour Wednesday in San Diego before returning to Los Angeles for a show at the Staples Center, which may or may not be meat-free for the show.